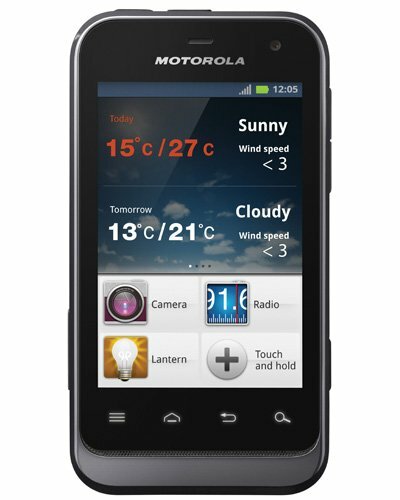 The original Motorola Defy from 2010 was aimed at a niche that no-one else knew was there – rugged cool. The thinking was that rugged phones that were hard to damage were a great idea, but that chunky rubber casings and hard-to-press buttons tended to put people off. The original Defy looked more or less like a normal phone, but came with Gorilla Glass, a tough but svelte shell and protective grommets for its orifices, as did last year’s Defy+ update. This latest version has all that too, but in a more compact package, and with a few interesting updates. Its name may give the impression that it’s small but actually, there’s really not that much of a risk of you losing the Defy Mini down the back of the sofa. 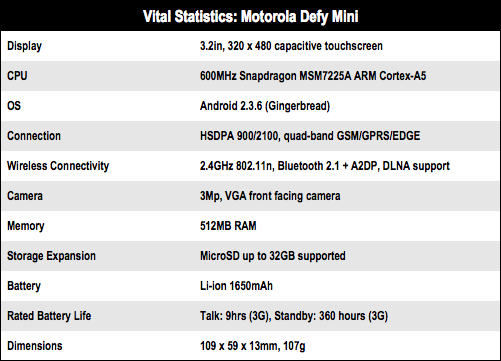 At 109 x 59 x 13mm it’s still way bigger than Sony Ericsson’s Xperia Mini Pro (90 x 52 x 17mm) for instance, and closer in size to HTC’s Explorer (103 x 57 x 13mm) which it actually shares the same CPU with; – Qualcomm's revamped low-end Snapdragon S1 MSM7225A. So it might seem slow on paper, but this actually a fairly recent chipset. 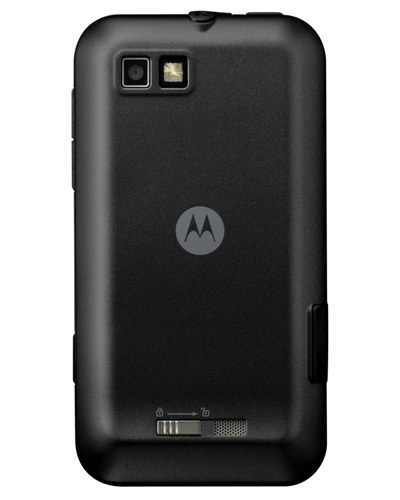 The case is still tougher than most though, made of rubberised plastic, with the 3.5mm headphone jack neatly sealed by a rubber grommet that slots into the port, and the micro USB slot hidden behind a sturdy cover made of the same stuff as the casing. The back plate is secured with a lock switch which makes it easy to open, though it’s not clear if this in any way helps to seal the casing any tighter than normal. Despite some claims on the web that it’s meant to be waterproof, Motorola itself makes no such claim, just that it’s water resistant, and sure enough, the bung hiding the microUSB port doesn’t look like it would withstand being submerged in water for very long, though it will certainly protect against splashes and drips. But yes, that Gorilla Glass by Corning is pretty tough, at least it stood up to an attack by an irate bunch of keys and some change without a scratch, as well as a couple of drops onto a stone floor from shoulder height. That doesn’t mean you should expect it to survive being thrown from a speeding car or that it will save your life by stopping a bullet – it might be a bit tougher than the average decently put together phone, but not much tougher.